This grilled chicken recipe is truly bursting with all the flavor and exquisiteness of Thai cooking! Marinated in a garlicky sweet and sour sauce, the chicken pieces are then easily barbecued or oven-baked to perfection. Add my special homemade Thai sauce as either a dipping sauce or a glaze, and this dish will be the life of your dinner or lunch party! 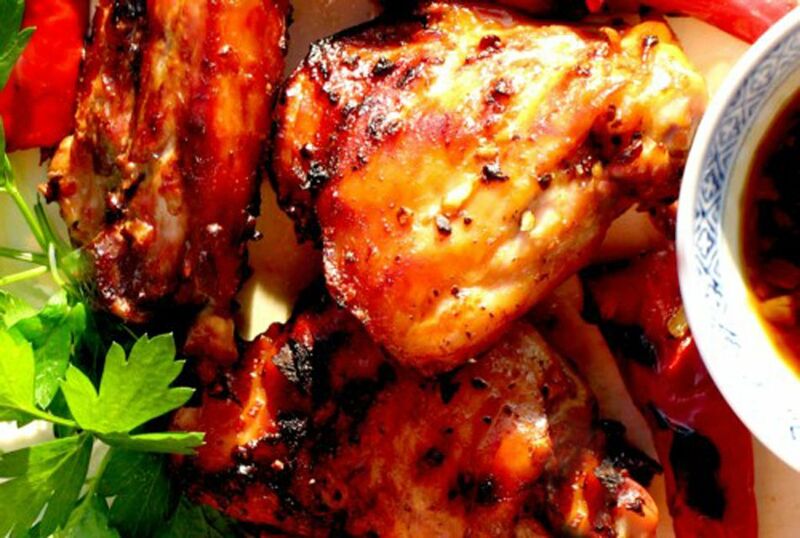 It's a classic Thai BBQ chicken recipe you will want to keep in your recipe files for life! Combine all marinade ingredients in a bowl and stir well to dissolve the sugar. Add chicken, turning several times to ensure the chicken is covered and literally bathed in the marinade. Cover and place in the refrigerator to marinate at least 2 hours, or overnight is even better. To make the dipping sauce/glaze, place all the dipping sauce/glaze ingredients in a saucepan. Stir and bring to a boil (the smell will be quite pungent as the vinegar burns off). Reduce heat slightly to keep it on a gentle boil. When sauce has reduced to 1/3 and is bubbling all over the surface, remove from heat. The sauce will thicken as it cools and should taste tangy - a mixture of sweet, sour, salty, and spicy. Note that it's best to make the sauce right before eating, or it will thicken too much. If this happens, reheat and add a little water. Serve with the dipping sauce on the side, or spoon a little sauce over each piece of chicken as a glaze before serving. This dish goes well with a salad or served with rice. ENJOY! Cook the chicken in your oven! Place chicken pieces on a grill pan or on a baking sheet lined with foil. Bake at 375 degrees for approximately 45 minutes, or until chicken is nearly done (thicker pieces may need slightly longer). Then Turn oven to the "broil" setting (on "high" if you have a choice), and move chicken to one of the upper racks of your oven. Baste both sides of chicken with the leftover marinade, or with a little of the dipping sauce, then broil 3-5 minutes per side, or until fully cooked (stay near the oven for this process, or chicken may burn).